Made with locally sourced beef and vegetables from local family owned farm. Our signature homemade golden puff pastry, crammed with locally sourced ground beef and sweet onions from a nearby family farm that’s been going for generations. Oh, and don’t forget it’s all cooked in a rich gravy you’ll find hard to beat. Beef, Pastry (Wheat Flour, Water, Lard, Non Hydrogenated Vegetable Shortening (Palm & Canola Oil), Salt, Dough Relax El7 (Soy Oil, 2% Or Less L Cysteine, Ascorbic Acid, Enzyme)), Onion, Gravy Powder (Water, Modified Starch (Maize), Salt, Wheat Flour, Caramel Color, Dried Onion, Dextrose, Yeast Extract, Spice, Natural Flavor, Tricalcium Phosphate (prevent Caking)), Pepper, Glaze (Maltodextrin, Dextrose, Color (Caramel), Emulsifier (Carboxymethyl Cellulose). They were delicious! Just like home! These pies are a little bit of home, excellent. Pastry just right.My American wife had her first taste, she wants more. 5 Star grade. It was really good , remind me of home !!! Actually, I bought and sent these as a gift to a friend in Virginia. He summed it up by a big YUM! It was great. Am reordering. Need I say more. Truly delightful! 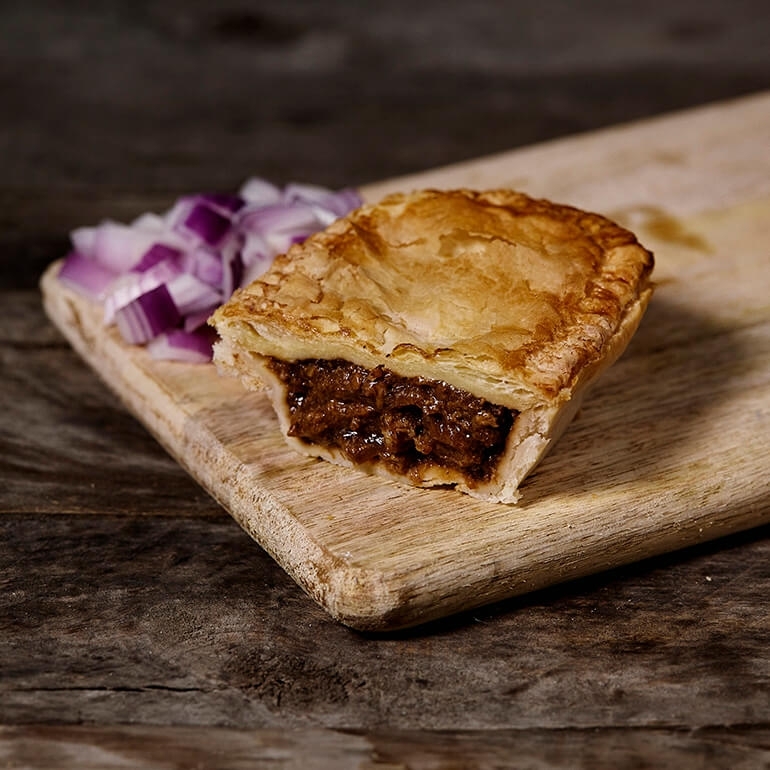 These are easily the best meat pies we have ever enjoyed! Will definitely keep coming to the English pork pie company for all our pie needs. Crust nice and flaky, filling was filling and excellent. Will buy again. Delicious and authentic. ..well done..we will definitely be ordering more! Enjoyed the pie, but I remember the pies from home were meatier and very thin pastry... Different but good. A delicious taste for one person. The pie is just the right size with very good ingredients. I'd suspect I was pregnant if I wasn't 74 years old! I have such a craving for these delicious pies. Truly love these pies....great in a pinch or anytime! Delicious pie - a yummy taste of home!!! i was eating one of the beef and onion pies the other day with tatos and veg god i thought on home, i just wish i was closer to New York so i could get more without being mailed. All the pies I have purchased from you have been delicious. Will most definitely reorder. First time ordering and first time having legit english pies. The crust is fantastic, So flaky!! The flavor was great. Very much enjoyed. I can't say enough good things about the taste and quality of the food from English Pork Pie Company. We purchased several items and have eaten the Beef & Onion Pie and the Sausage Rolls. Out of this world and just like they have in England! Will be purchasing from them again! fantastic pies god i would eat them every day. I am from York city, but live here in the states now but these pies bring some i love over here real English food Happy St George Day. From a yorkshire man who know go food. phil. Just like I remember, very delicious. This was one of the first English Pork Pie Company items that I tried and it's really great. Nice and beefy, wonderful flavor, great flakey crust. I'll definitely be ordering more. They were very good and went over well with the family. I will be ordering again in the near future. Thank you. Loved it. Seemed very authentic. Loved it. Seemed very authentic. Would like family sized pies better, however. An excellent Meet pie, just like home. I am never disappointed with TEPPCo, it was a miracle the day I found the website, there is no comparison. 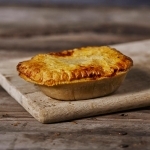 I remember going on to a website of an English store in Florida who were selling "Pork Pies", what a disappointment to find that in actual fact it was an ordinary meat pie with gravy except they used pork instead of beef. To say least I have never been back there and am happy to pay the extra to get the real McCoy! What a fun site to so some shopping for the Brits in your life or those that like met pies! We ordered lots of great things and just loved the sausage rolls. Ordered pies as a treat for my husband's b-day. We just went to the UK this summer. The English Pork Pie Company's pies are as delicious as I remember. Also, I'd requested a specific ship date and they were able to oblige. Very pleased. Delicious and perfect for winter comfort food. The pastry is very tender and flaky. worked fine in the toaster oven as well as traditional oven. Met our expectations. Great with a Harp! I haven't had proper meat pies in years. And then I discovered the English Pork Pie Company.These are great! pork pies great ,Beef & Onion Pie delicious, little bit salty. Pies are a taste of home!!! One Word - YUM !! The Beef & Onion Pie I tried recently was awesome!